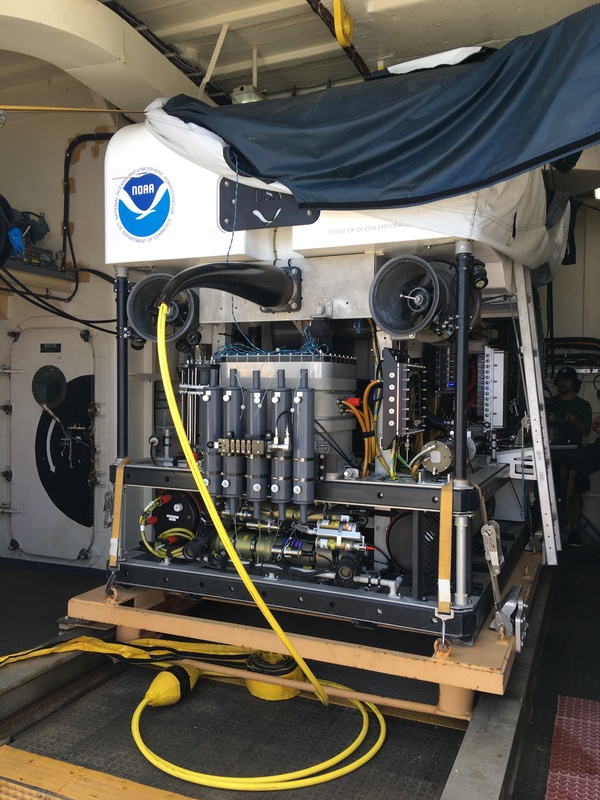 Since the Okeanos Explorer is known as “America’s Ship for Ocean Exploration,” it is equipped with two important vehicles that allow scientists to study normally inaccessible ocean depths. 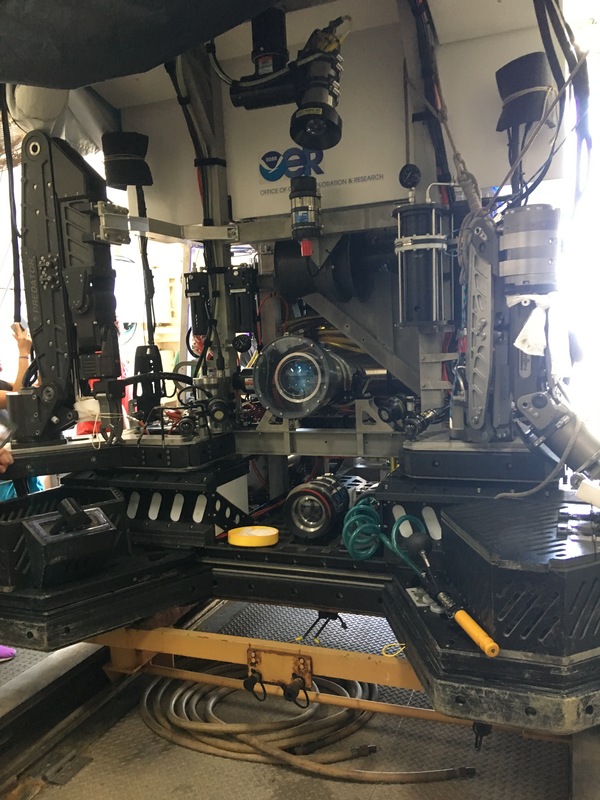 Deep Discoverer (D2) is a remotely operated vehicle (ROV) that is mechanically designed with software and video engineering programs that generate precise images and videos. 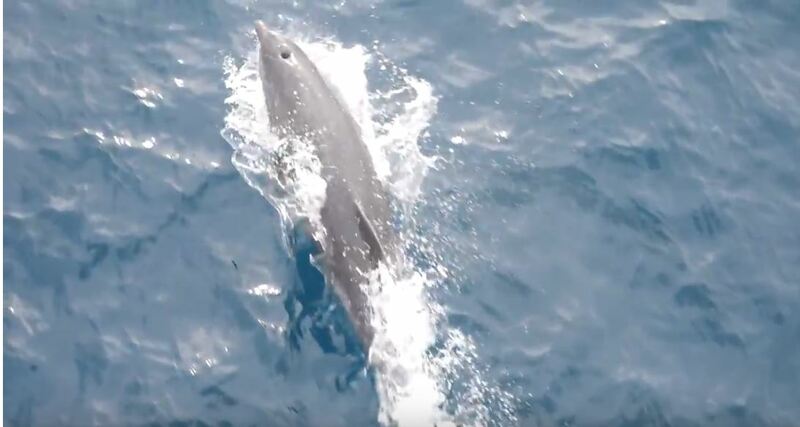 A total of nine cameras, including a Zeus Plus camera with impressive zoom capabilities, produce high-definition images that give scientists and those on shore insights about deep-sea ecosystems. The 9,000 pound ROV contains approximately 2,400 feet of intricate wiring as well as specially designed Kraft predator hand that can hold up to 200 pounds. The hand is especially useful for deep-sea sampling and allows scientists to bring certain organisms to the surface for further analysis. D2 can dive up to 30 meters per minute and is designed to withstand pressures almost 600 times that at sea level. D2 does not operate alone during the eight-hour dives. Instead, it relies on assistance from Seirios, another 4,000-pound machine known as a camera sled. 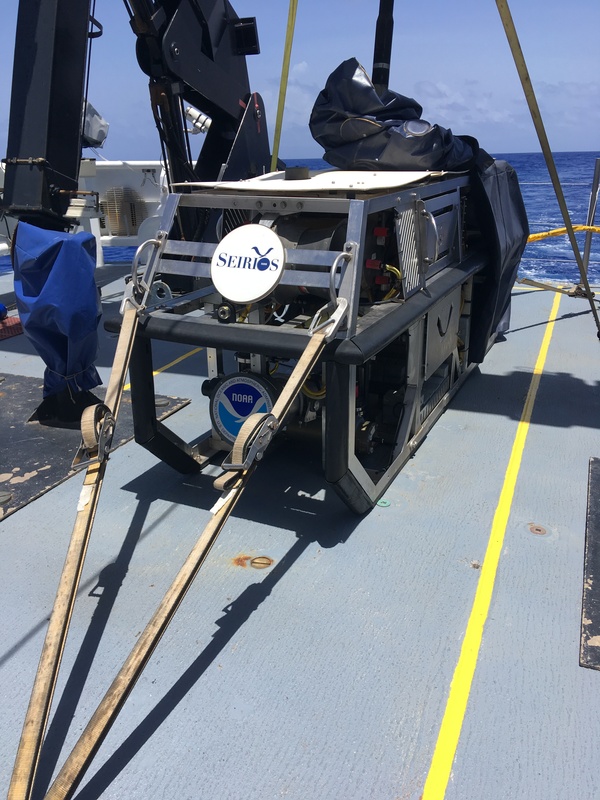 This device is powered and controlled by the Okeanos Explorer and offers the pilots and scientists a wide-angle perspective as they navigate the ocean floor. Seirios is tethered to the Okeanos Explorer and illuminates D2 from above to allow for increased visibility. The frame of this machine is relatively open which increases the distance cameras can be separated from the mounted lighting. This design reduces the light that reflects off particles in the water (optical backscatter) and results in high-quality images. This camera sled, known as Seirios, is used to illuminate D2 during ROV dives. All of the deep ocean images and video collected by D2, Seirios, and the Okeanos, can be transmitted to the rest of the world by satellite. 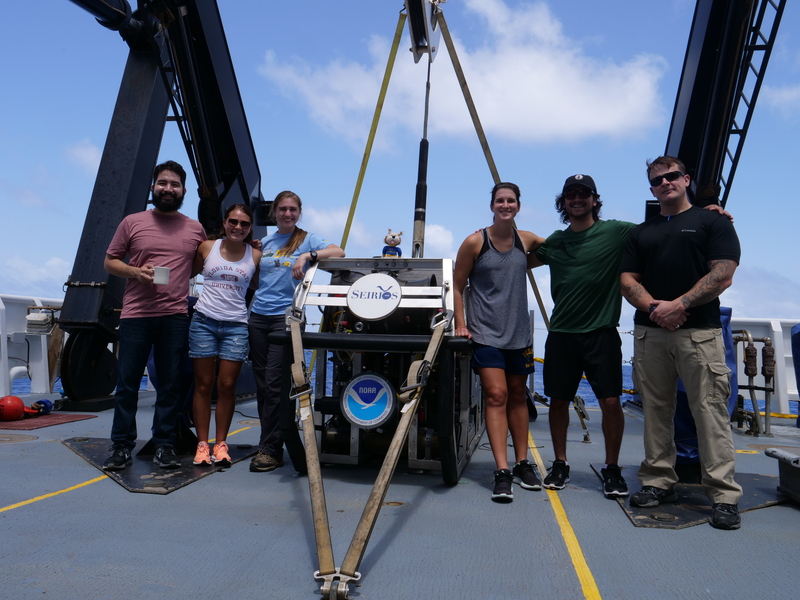 The Okeanos is fitted with telepresence technology that enables everyone involved in the operation to provide scientific context to the public. 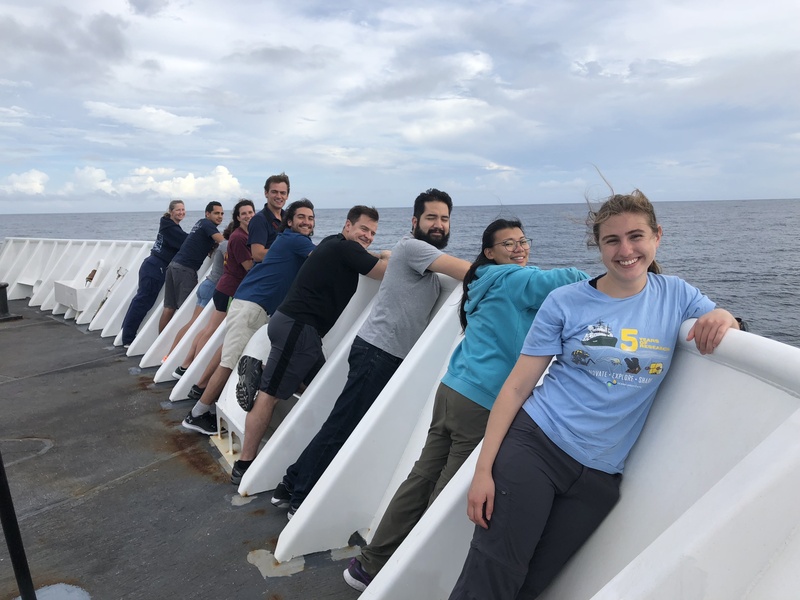 The ability to broadcast this exciting information requires effective collaboration between the Engineering Team, NOAA ship crew, and scientists both onboard and onshore. It is amazing that anyone with Internet connection can be involved the expedition and science in real time. The Mapping Team learning about Seirios! In order to make it back to Norfolk on time for dry dock, we will have to finish our mapping our survey area on the 27th. In the meantime, we have been continuing to process data, collect sunphotometer readings, launch XBTs, and play cribbage. Our cribbage tournament will conclude on Friday night! Everyone aboard is excited about the data we’ve collected and looking forward to a successful end of the expedition. The Mapping Team was on the lookout for dolphins! Dolphins playing on the waves near the bow! Another fantastic end to the day! The first fully developed ROV, POODLE, was created by Dimitri Rebikoff in 1953. However, it was not until the US Navy took an interest in ROVs that this unique technology became very popular. In 1961, the US Navy created the Cable-Controlled Underwater Research Vehicle (CURV). Map showing the planned operations area for the expedition outlined in yellow. Image courtesy of the NOAA Office of Ocean Exploration and Research. According to the Oceanic Institute, the oceans cover 71% of the Earth’s surface. This is calculated to be 335,258,000 square kilometers! Recently, the Okeanos Explorer mapped over 1,000,000 square kilometers of the seafloor using high- resolution multibeam sonar. Although this may not seem like much, that region is larger than the areas of Arizona and Texas combined! 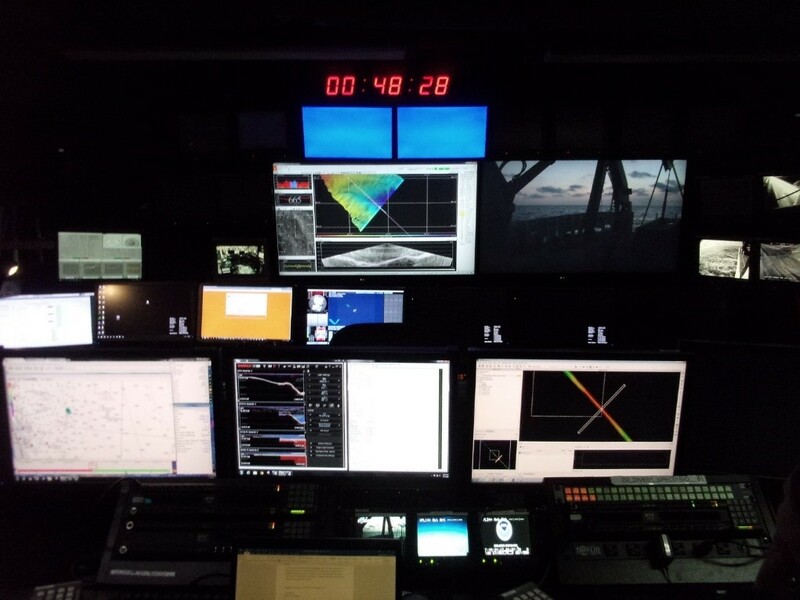 So why is it so important for the Okeanos Explorer to map the seafloor? The ocean’s terrain plays a very important role in ecosystems since underwater valleys determine currents and weather patterns, sea topography influences fishery management, and seamounts serve as protection against unpredictable storms. Therefore, high-resolution maps allow scientists to categorize marine habitats, provide information vital to protecting and tracking marine life, and enable us to make smart decisions for solid, sustainable conservation measures. In order to successfully map the ocean floor, multibeam sonar is used. 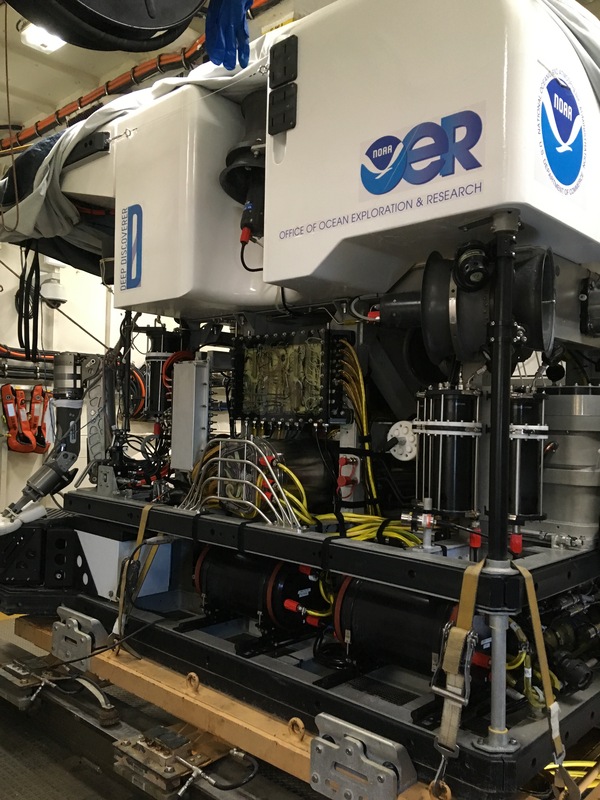 The Okeanos Explorer uses an EM 302 multibeam system that is designed to map a large portion of the ocean floor with exceptional resolution and accuracy. The EM 302 transducers point at different angles on both sides of the ship to create a swath of signals. Transducers are underwater speakers that are responsible for sending an acoustic pulse (known as a ping) into the water. If the seafloor or object is in the path of the ping, then sound bounces off the object and returns an echo to the transducer. The EM 302 has the ability to produce up to 864 depth soundings in a single ping. The time interval between the actual signal transmission and arrival of the return echo (two way travel time) are combined with a sound velocity profile to estimate depth over the area of the swath. In addition, the intensity of the return echo can be used to infer bottom characteristics that can be utilized for habitat mapping. Since the EM 302 creates high density, high-resolution data as well as water column features, this sonar system is ideal for exploring the seabed for geographic features. 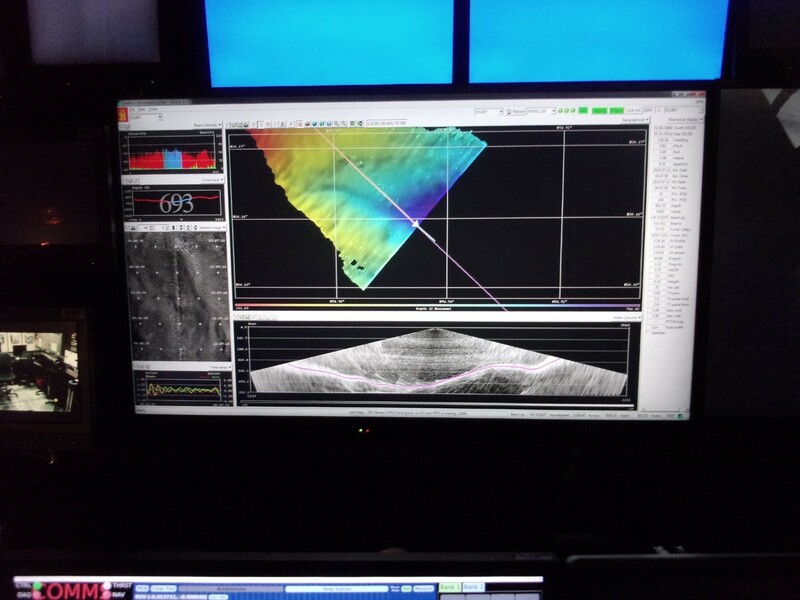 The image below shows data being collected by the multibeam sonar on the Okeanos Explorer. The colors are used to indicate swath depth (warm colors indicate shallow waters while cool colors indicate deeper waters). As this data is being collected, it must be “cleaned” to eliminate any erroneous points. Data is collected and cleaned in both the Dry Lab and Mission Control Room. Since we have not reached the survey area yet, we have been monitoring the depth of our path thus far. We are collecting transit data which is considered to still be valuable data for unmapped seafloor area, but it may not be as high quality as focused mapping data. 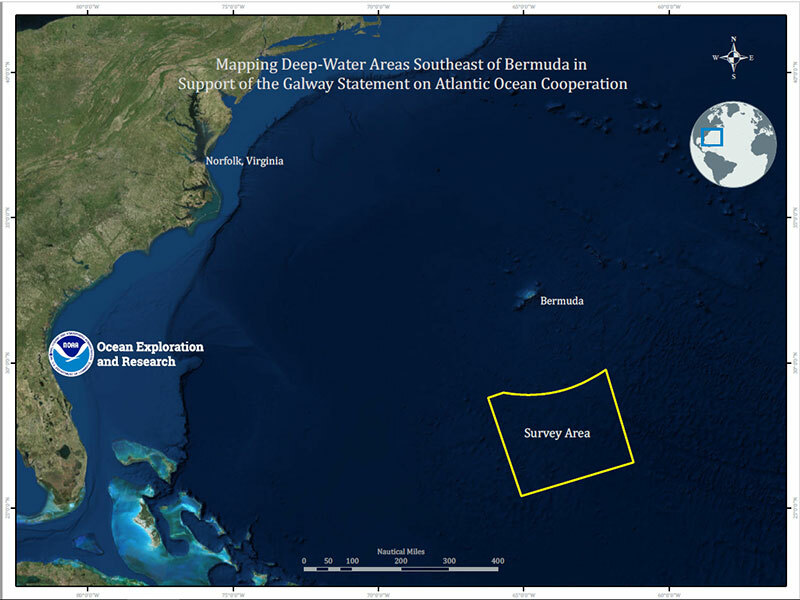 We will continue to collect transit data until we reach the survey area near Bermuda. 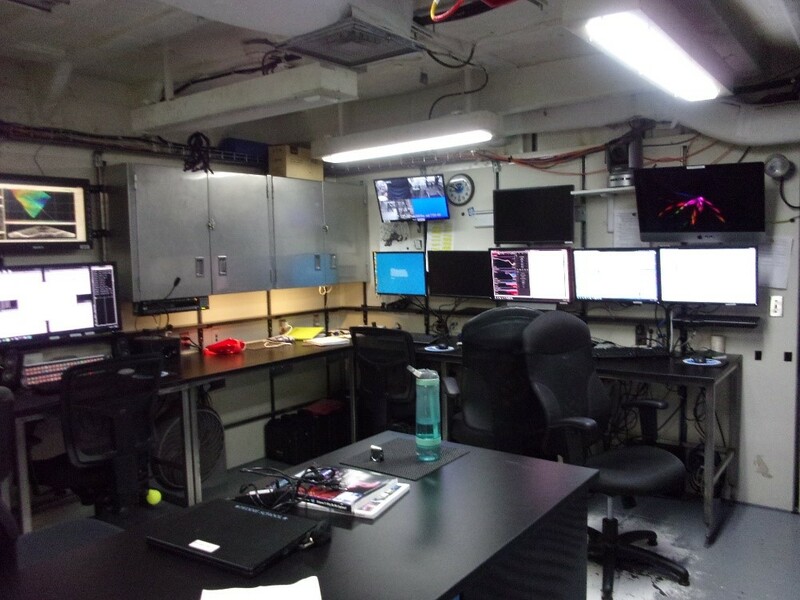 Life onboard the Okeanos Explorer has been a very interesting and fun learning experience! The ship runs on a 24/7 operation schedule and people are working diligently at all hours of the day. Everyone on the ship has been really welcoming and willing to share their stories and insights about their careers at sea. I am really looking forward to speaking with more people to learn about their experiences! 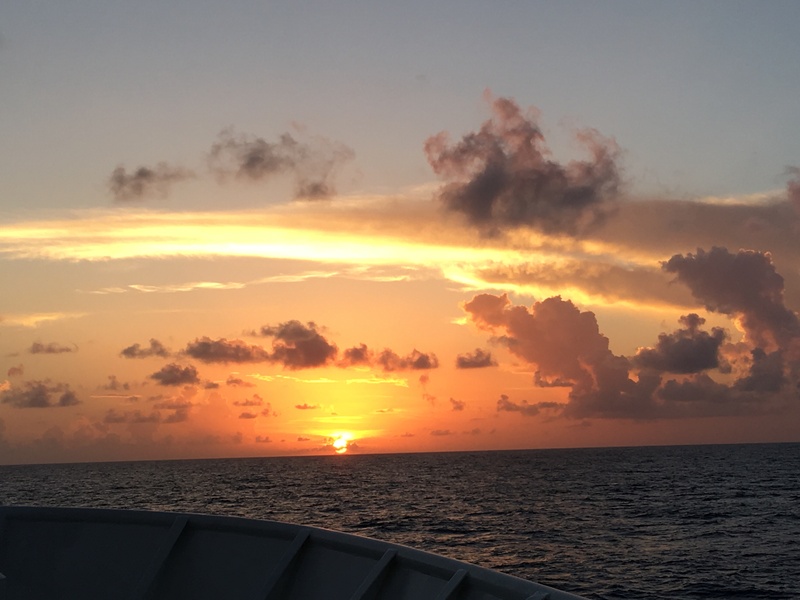 We set sail out of Norfolk today and began our 3.5 day/4 day transit to the survey area near Bermuda. This morning, we found out that we will need to schedule an emergency dry dock towards the end of our mission to solve an issue with a stern thruster necessary for ROV cruises. As a result, we will not be ending up in port in St. George, but we will still be able to map the area 200 nautical miles off the coast of Bermuda, so that is great! Sonar is short for Sound Navigation and Ranging.